With Pentax’s track record of producing robust DSLRs with interesting and often unique features at competitive prices, enthusiasts have been patiently waiting for the Japanese manufacturer’s first full-frame offering. Packing a 36Mp CMOS sensor in a weather-sealed body, the new K-1 certainly looks like it’s been worth the wait. Costing just $1,800 body only, it’s the cheapest 36Mp full-frame DSLR currently available, saving you $100 compared to the $1,900 mirrorless Sony A7R, and around $1000 cheaper than the $2,800 Nikon D810 DSLR. Pentax has also priced the K-1 to challenge its main full-frame competitors, such as the lower-resolution 24.3Mp Nikon D750 at $2,000 and the 20.2Mp Canon 6D for $1,400. Compatible with all Pentax K-mount lenses from 1975 onwards, the K-1 is an attractive option for Pentax shooters looking to use legacy lenses, including Pentax DA-mount lenses, which will work on the K-1 in its 15Mp APS-C crop mode. A range of new weather-sealed lenses, including a 15-30mm f/2.8 wide-angle zoom and 24-70mm f/2.8 or 28-105mm f/3.5-5.6 standard zooms, is also available for photographers after a completely weatherproof unit. All lenses will work with Pentax’s built-in SRII sensor-shift shake reduction system, which offers up to 5 stops of image stabilization, correcting camera movement across 5 axes. The K-1 also features Pentax’s unique pixel shift system, which shoots four exposures and merges them together in-camera to create a 180Mb TIFF with greater detail and color accuracy. Pixel shift is recommended for shooting static subjects on a tripod, to minimize ghosting when the images are merged, which rather limits its effectiveness for many subjects, but it could be an interesting feature for product, still life, or architectural photographers. The latest Pentax PRIME IV image-processing engine offers 14-bit processing for rich, detailed images, and Pentax’s Anti-Aliasing filter simulator can be activated to minimize any moiré or false-color effects, or turned off to maximize resolution. The autofocus system features 33 phase-detection targets (including 25 of the more accurate cross-type variety), which are positioned quite centrally in the frame in full-frame mode, but offer edge-to-edge coverage in APS-C mode. There’s also a range of operation assist lights to illuminate not only the control buttons, but also the lens mount, memory card slot, and LCD screen for easier operation in low-light environments. For video, the K-1 records Full HD 1920×1080 resolution movies at up to 60fps, features a built-in stereo microphone with external mic compatibility, and is capable of recording clips up to 25 minutes (or 4GB) long. There’s also an Optical Viewfinder (OVF) with 100% frame coverage, 4K timelapse videos, USB and wifi connectivity, as well as a built-in GPS module. The Pentax K-1 achieves an outstanding overall DxOMark sensor score of 96 points, a significant step up from Pentax’s best APS-C sensor score of 82. Color depth (Portrait) offers a one-stop improvement over previous Pentax APS-C chips, scoring 25.4 bits compared to 23.9 bits on the Pentax K-5 IIs. Dynamic range (Landscape) gets a half-stop boost, scoring 14.6 EV compared to 14.1 EV on the K-5 Iis; but the most dramatic improvement is for the K-1’s low-light ISO (Sports) score. 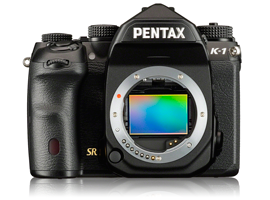 With 36.4 million pixels on a full-frame sensor compared to 16.3 million on the K-5 IIs APS-C chip, the K-1’s pixel pitch isn’t vastly superior, but Pentax made significant improvements to the signal-to-noise ratio on its first full-frame sensor, which achieves an excellent Sports score of ISO 3280, compared to ISO 1208 on the K-5 IIs. The new Pentax high score puts the K-1 in fifth place for all sensors we’ve tested and an impressive third place podium position for full-frame interchangeable lens cameras. Sitting just behind the Sony A7R II with 98 points and the Nikon D810 with 97 points, we can say that the K-1 offers very similar overall image quality to these class-leading sensors. The Sony A7R II boasts around a third of a stop better color depth at base ISO, but the K-1 offers superior dynamic range and very comparable low-light ISO performance. The Nikon D810 just edges the K-1 for both color depth and dynamic range, but the results are very close, and the K-1 trumps the Nikon by around a third of a stop for ISO, with scores of ISO 3280 vs. ISO 2853, respectively. Of course, as sensitivity increases, image quality deteriorates, so how does the Pentax K-1 fare at higher ISO settings? Dynamic range descends in a very linear fashion from its high of 14.6 EV at ISO 100, and continues to offer good dynamic range around 10 EV as high as ISO 3200. Dynamic range remains at a respectable 7.92 EV up to ISO 12,800; and though dropping to a low of 3.92 EV at the top standard ISO output setting of 204,800 ISO, many photographers rarely use such high sensitivities. Color depth is good (above 20 bits) up to ISO 1600 and respectable up to ISO 6400. Combined with the K-1’s excellent SNR 18% result of 30dB at ISO 3200, the K-1 produces very good all-round RAW file image quality up to ISO 3200. The Nikon D810’s achieves its fractionally-higher headline dynamic range (Landscape) score of 14.8 EV at its base ISO of 64. The K-1 achieves a very close 14.6 EV at ISO 100, however, and between ISO 100 to ISO 800, offers greater dynamic range than both the Nikon D810 and Sony A7R. All three 36Mp sensors offer good dynamic range of over 10 EV up to ISO 3200. The downward trajectory for color sensitivity (Portrait) scores is also very similar for these three competing 36Mp sensors as sensitivity is increased. At ISO 100, all three sensors record fantastic color of 25.4 bits (K-1), 25.6 bits (A7R) and 25.3 bits (D810), and continue to offer good color over 20 bits at ISO 1600, as well as reasonable results around 17 bits at ISO 6400. Signal-to-Noise Ratio (SNR 18%) analysis shows that for printed results, the K-1, D810, and A7R broadly offer the same levels of noise at all sensitivities. Excellent SNRs are achieved up to ISO 400, with well-controlled noise on RAW files at ISO 1600, too. At the higher sensitivities, noise becomes more prevalent, with the Sony A7R performing slightly better at ISO 25,600 and the Pentax K-1 showing its lowest SNR of 7.1dB at ISO 204,800. Scores against the similarly-priced but lower-resolution Nikon D750 and Canon 6D sensors put the Pentax K-1 on top, with the highest scores in all categories. Against the 24Mp Nikon D750, the K-1 offers around a half-stop better color depth, with scores of 25.4 bits vs. 24.8 bits; and fractionally-improved dynamic range, with scores of 14.6 EV vs 14.5 EV. The K-1 fares much better against the Canon 6D in these categories, offering at base ISO a 1-bit color advantage at 24.8 bits, and a significant 2.5-stop improvement in dynamic range, scoring 14.5 EV compared to just 12.1 EV for the 6D. That doesn’t tell the whole story, however, because while dynamic range on the K-1 and D750 reduces in a linear downward fashion as ISO sensitivity increases, the 6D maintains its score of around 12 EV up to ISO 800. So between ISO 100 and ISO 400, the Pentax and Nikon models offer an advantage, but from ISO 1600 onward, the scores are much more comparable. The pattern isn’t quite the same for either Color Depth or SNR 18% results, where all three models show a similar downward trajectory as ISO is increased. As a result, all three sensors offer good color of around 20 bits and reasonable levels of noise in RAW files up to ISO 1600. Boasting a robust, weather-sealed construction with some interesting features, including built-in stabilization, pixel shift image merging, and Pentax’s AA filter simulator, the Pentax K-1 offers a lot at a competitive price point. What’s more, image quality is among the best we’ve tested for full-frame interchangeable lens cameras. If you’re looking for a high-resolution 36mp DSLR for large prints, or top-quality advertising, editorial, or wedding work, the K-1 offers slightly better dynamic range and comparable results for color and noise compared to its 36Mp rivals. Its sensor scores are a cut above similarly-priced full-frame offerings from Nikon and Canon, too. The K-1 boasts better results for dynamic range at lower ISO sensitivities compared to the Canon 6D, and very similar scores to the Nikon D750 in these categories as well. It’s also ahead for color sensitivity at lower ISOs, and despite greater resolution than both the 6D and D750, it maintains similar signal-to-noise ratios. So the K-1 is a successful first full-frame DSLR from Pentax, giving photographers looking for great image quality another camera to consider. If you’re not already heavily invested in a particular brand’s lenses and accessories, put the 36Mp Pentax K-1 on your short list.